Welcoming in the new year with another batch of your most recent comments. Marty Robbins wrapped up the year of 1980 with a three-performance New Year's Eve show in Evansville, Indiana. After returning home to Nashville, he experienced chest pains. "I thought it was just an extra bad case of indigestion," he said later, "because I've had a heart attack, and it was nothing like the one in '69." That one had required triple-bypass surgery in January 1970. Now, 11 years later, he waited several days before calling his doctor for an appointment the next day. The doctor insisted he come to the office immediately. "I had on a big cowboy hat, a straw hat, I had on boots and jeans and a big jacket like real cowboys wear, y'know," Marty recalled. The doctor checked him and called an ambulance. Marty thought he was kidding until ambulance attendants rolled in a stretcher. "Doctor Ewers," Marty said, "I'm not dressed for the hospital." The doctor insisted he get in the ambulance. Marty felt embarrassed to be wheeled through the waiting room on his back, dressed in his outdoor clothes with his hat lying across his chest. He spent almost two weeks in the hospital and another six weeks at home before resuming his touring schedule. I like #3, sung by Sonny Til & Orioles. Seems like everybody's got a Christmas and New Years song. How many people have a song for "After New Year's Eve"? YouTube - The Heartbeats - After New Year's Eve 45 rpm! Here in New York, WCBS-FM is playing the Top 101 Party Songs this weekend. They played #1 last night in Times Square after the countdown to the New Year. I want to wish a Happy New Year to you and everyone who reads Forgotten Hits. I just posted my latest radio interview show and it's a bit different from my previous ones. My guest is not an oldies star per se. She is primarily a TV star. Most notably, she played the role of "Cissy" in all 138 episodes of the beloved sitcom "Family Affair," which ran from 1966 through 1971. Okay, if we stretch things a bit, she dpes have an oldies connection of sorts. She recorded a Christmas song called "Lem, The Orphan Reindeer" and that was written by hit songwriters Tommy Boyce and Bobby Hart, best-known for their own recordings and some songs they wrote for the Monkees. I know that there are many oldies fans who loved that sitcom, so if you're interested, you can listen to the show by clicking the link here Ronnie's Radio Page -- and then clicking on Kathy's picture at the lower-left of the screen. I will admit to having a brief crush on Cissy ... or was it Mrs. Beasley?!?!? So get your questions in early and we'll see what we can put together! It's another exclusive "Ask The Artists" Segment in Forgotten Hits. After you mentioned Time For Living by the Association, I went looking for my greatest hits album. I could find the jacket but sadly not the album. So I went on Deep Discounts and ordered it because I remembered how much I loved that album. So then you go and mention No Fair At All and Goodbye Columbus and, of course, I had completely forgotten how much I loved No Fair At All ... in fact, I had forgotten about the song completely! And even if I had thought about it, I am pretty sure I would never had remembered it was The Association. So of course I went on line to Deep Discounts and ordered Renaissance and Goodbye Columbus ... so you should change the name of Forgotten Hits to Renewed Memory. And look at how helpful you are with the economy by getting people to buy old music. Thanks! BTW, I loved a lot of the letters you printed that people wrote in to AOL after your run in with the Terms Of Service police. There is a lot of humor in this world. Humor and music ... two of my very favorite things. Teena Marie, known as 'Ivory Queen of Soul,' dies http://www.comcast.net/articles/music/20101227/US.Obit.Teena.Marie/# She was one of the greatest contemporary singers of the modern era. Saw her earlier in the year live in Miami … she rocked the house. May her soul rest in peace. I know I told you before, but I'll tell you again ... it was 1960, not 1962! Not all of the tracks that claim to be unreleased actually are ... however, some of the previously released songs are now in stereo for the first time, such as an all time favorite of mine called Return My Love, which was only issued as a 45 in the Philippines, I believe ... perhaps Dave Clark never knew it was issued there and thought it was completely unreleased. Also, some of the songs claiming to be Dave Clark Five tracks are sometimes just Mike Smith solo recordings from the 70's or unreleased "Dave Clark And Friends" recordings. Elton John has a son. How did he do that ? Click to find out. A surrogate mother gave birth to a son for Elton John and David Furnish on Christmas Day. Zachary Jackson Levon Furnish-John (WOW, now that’s a name! ), who weighed in at just under eight pounds, was born in California to a woman they declined to identify. It sounds like they found some pre-Sun recordings. A few "quickies" here to help clear the decks! I found your great blogs looking for Mauds info today. I was stunned and sorry to find out (belatedly) about Jimy Rogers. I was also looking at the First 45s stuff and thought I'd share mine. Last time I told you I couldn't figure out why two Clay Cole Songs were on my "The Capris: Our Story" CD. I just found a booklet with the CD. At first I didn't see it. It was kind of tucked behind the front label. The booklet said that the Capris backed up Clay Cole on "Don't Twist With Anyone Else But Me" & "Twist Around The Clock". The Capris also toured with Clay's Review, 1962 & 1963. 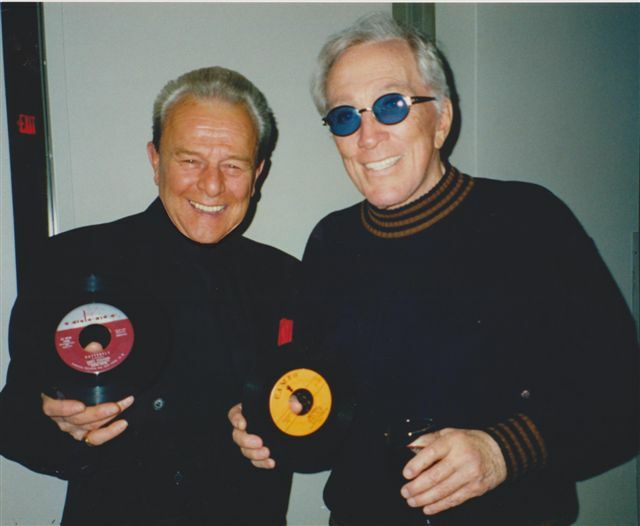 Another one of those strange things - Clay Cole & Nick Santamaria, lead singer of the Capris died just weeks apart. I'll miss both of them. Here's a clip of Nick talking about his health problems. Thanks for the info, Kent ... I passed this info on to the owners and they appreciated the feedback! I am sorry some of your readers were unable to access the site ... the direct feed is http://s4.viastreaming.net/7730/listen.asx. This allows you to bypass the station altogether and may make it easier for you to tune in. Please let your readers know that I am delighted you were trying to catch the station (and my show) and I encourage you to try again! I am on the air every Sunday, Monday and Thursday nights from 7-9 pm Eastern Standard Time ... Happy New Year, and thanks again for your interest and support! These are nice clips ... Carly in her prime (and let's face it, she didn't perform a lot so these are especially nice to see!) It would be nice if some of this stuff became available again ... in the meantime, we just have to rely on YouTube I guess to see some of these vintage performances. A friend just turned me on to your newsletter ... VERY COOOL!!! Just thinking about the old days when things were simpler ... now everything is such a rush everywhere!!!! Please sign me up!! It's great to see that you cover so many artists looking back and seeing when music was real ... not what kids are buying now!!!!!!!!! !I am a tribute artist and take great pride in my craft my tributes to ELVIS AND NEIL DIAMOND, just to name a few are my favorites! The music they created is timeless!! I have seen ELVIS in 77 MAY CHICAGO STADIUM it was a night I will never forgot!! Neil Diamond since the 70's and he still puts on a great show!!!! I am celebrating ELVIS' BIRTHDAY JAN 8 AT THE SKOKIE THEATER AND NEIL'S ON JAN 23 ... maybe some of your readers will have a chance to check out my tributes to these two great singers. My take on oldies music is a Samuel Butler quote I got from my Dad. Butler was a Victorian-era author, described as an iconoclast, who wrote, among other things, the Utopian satire "Erehwon." He said: "The oldest books are only just out to those who have not read them." Amen, and all the best for 2011! As I suspected it would, visitation to The Forgotten Hits Website dropped off SIGNIFICANTLY since we stopped sending out daily reminders and access links. You guys have just GOT to find your way there on your own ... it truly isn't worth the hassle of fighting with AOL over this after all these years. Or simply subscribe to the link offered at the bottom of the web page and they'll send you automatic reminders every time a new posting is made. Can somebody PLEASE get back to me on this? I need your help! I have written (and called) several times before but NOBODY is getting back to me to let me know exactly WHAT "terms of service" I violated recently. Is there ANYBODY there who can get back to me in a pro-active manner so that I can correct whatever it is I'm doing wrong to properly comply and conform? All I know for certain is that we have hundreds and hundreds and hundreds of subscribers who have ASKED FOR reminder links to be sent in order to visit the website(s) whenever new postings are made ... many of whom have taken the time to write to you personally to let it be known that these mailings are being sent to them BY REQUEST ... but since we stopped sending these requested announcements, viewership at the website is down SIGNIFICANTLY. These people DEPENDED on these reminders and the convenience of simply being able to click the link and go ... and EVERY person who received these links ASKED for them. And, since every email ALSO includes an opt on / opt off disclaimer, I just don't see what term of services I'm violating ... especially since I've been doing this for going on twelve years now!!! I am sincerely TRYING to comply ... but without ANY input or feedback from you, I don't know what it is I'm doing wrong. I do know that I have worked VERY hard to build up this loyal readership base and that this is greatly compromising my ability to continue to do so ... so PLEASE get back to me and let me know what I can do that will ultimately get ALL of us what we want.